You’ve heard of Gila Cliff Dwellings National Monument. It’s adjacent to the Gila Wilderness. I headed for the most popular Baldy trailhead – Crest Trail #182. I never made it due to mountain road improvements January 2017. ROAD CLOSED. So I read some of the Peakbagger trip reports instead. The consensus was not good: bad roads, snow into July, forest fire recovery sections, hunters. It will not go on our list of the best hikes in North America. It had been rebuilt over a period of 2 years costing over $4.4 million dollars. And opened again in 2016. I’d been advised by a Ranger that only the catwalk part of the trail was open. Hikers often continue on to #207. I would have wild camped if it had been open. Sadly, that Ranger was wrong. It was all closed due to flooding. Still, the Catwalk does look very cool. LESSON LEARNED — Before driving out to hike the Gila Wilderness, phone first to be sure your trail is open. Support Patagonia and Black Diamond. U.S. Sr Parks fees go up. Canada free in 2017. Canada’s Mountain Equipment Co-op has offered the best shopping for hikers for decades. I’d argue it’s still the best hiking shop in the world. But anyone in one of their stores in 2015 would concur it’s not as good as it once was. The staff is much younger and less experienced in the wild than in the past. Prices are higher. There’s too high a percentage of yuppie, urban crap on the shelves. Outdoor gear for city folks who have no intention of going to any mountains. Click through to Canadian Business magazine for a history of the change through to 2013. Below is our old information page, no longer being updated. It was 2 days,1 night. The good thing about this? We arrived at the summit at 7:00 in the morning. The cable car is built, but NOBODY is there at that hour, because it hasn’t opened yet! best months October through April. Some say April and May are best as it’s warmer. And the flowers are in bloom. bring warm clothes. Temperatures below freezing are frequent. climb is rough, wet, muddy and cold. Some bring rubber boots. Sapa is a tourist trap. Touts are a pest. Guided trips are no longer as inexpensive as they once were. Seems the government got stricter with guide requirements. We paid $95 for a one day, up-and-down for 1 person October 2014. A two day trek costs $180 for 1 person October 2014. You can negotiate on price with some agencies. Shop around. The official government tourist information office quoted $120 for the $95 tour. Assume the difference is commission. There are a number of options, including a 1 day guided up-and-down. It’s possible to do independently. But we wouldn’t recommend it unless you are familiar with the route. There are three routes to the mountain. One is from Tram Ton, the others from the villages of Sin Chai and Cat Cat. The first route is a more gradual climb because it has been selected for tourists. The trip can be made in a day. The route from Sin Chai is shorter but more adventurous, requiring climbers to sometimes use ropes or other special facilities for climbing. The route from Cat Cat is the longest, but mixes some challenging climbs with great scenery. After one day of climbing, there’s a break at 2,200m above sea level. Climbers can have a meal cooked by a Mong porter and camp, followed by a second camp at 2,700m before reaching the peak on the third day. Most climbers chose a tour from Sa Pa at a cost of about VND1.5 million excluding train fare from Ha Noi, and tours should be booked a month in advance. many hikers arrive by overnight train from Hanoi to Lao Cai, then bus from Lao Cai to Sapa. Those tickets sell out during high season, especially during holidays, as Sapa is super popular with Vietnamese. we stayed at the Sapa Unique Hotel for about $35 / night. It gets rave reviews. We recommend you hire a guide. Let them do the logistics. You simply enjoy the journey. 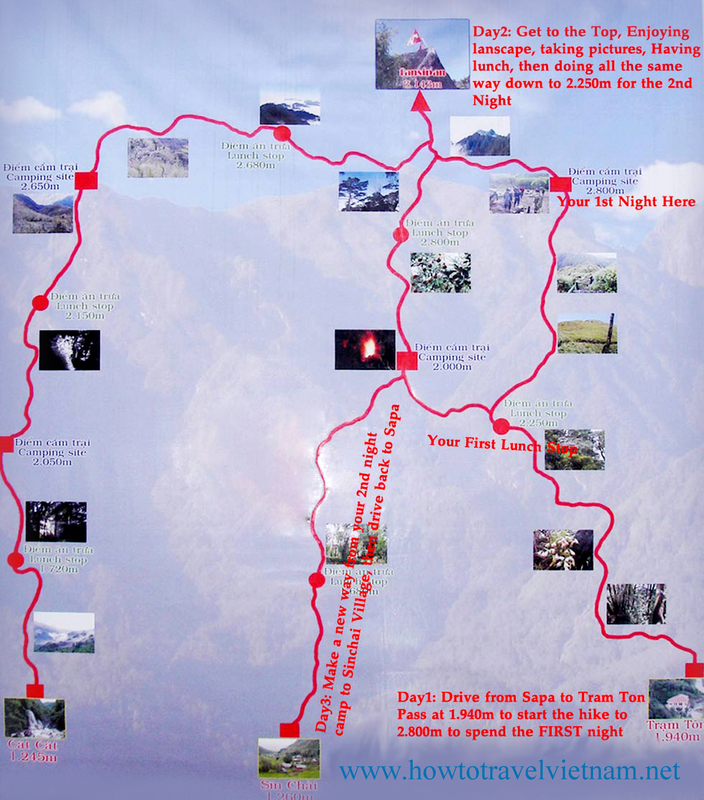 on the most popular route up from the Ranger Station Camp 1 is located at around 1,500m (4,920ft). Simple accommodation and food are offered. at 2,800m (9,190ft) is Camp 2. Sleeping is communal in a very poorly maintained ‘hut’. Might have rodents. Have your agency bring tents, instead. Camp 2 is trashed and unsanitary. Click PLAY or watch Leonard Boey’s 2013 trip highlights on YouTube.